On the 13th of the first lunar month. 愛知県稲沢市. Aichi, former Owari province. source photoguide.jp : MORE PHOTOS ! On the day before the festival 50 bags of kagami-mochi ritual rice cakes are offered to the deity. 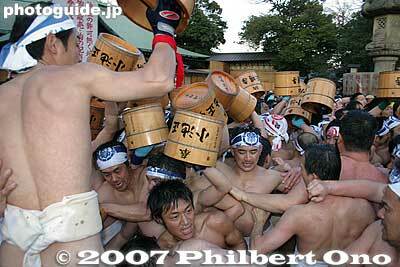 Many thousand naked men, only clad in a white loincloth and white tabi socks, fight around the "man of god" 神男 . They try to "drop off" the impurities of last year and cleanse themselves for the coming year. Afterwards, the mochi are cut and eaten by all to participate of the good luck for the coming year. This festival in this form dates back to end of the Edo period. It started in 787, when Emperor Shotoku Tenno 称徳天皇 (Shootoku Tennoo) ordered all the Kokubun-Ji government temples to hold rituals to ward off evil and the regent of Owari (Owari kokushi 尾張国司) started this ceremony. A man passing the shrine would be taken captive and all the impurities were laid on him. He was then offered to the deities for purification and after that, he could continue his travels. Human sacrifices were never made in this case, only ritual ones.
. Tsuina - Driving away evil spirits . A banquet that accompanies a matsuri. Usually understood as a meal consisting of the offerings made at the festival after its conclusion, the naorai is actually one of the constituent elements of matsuri. According to the Association of Shinto Shrines' Jinja saishiki, a naorai is included in major rites (taisaishiki), middle rites (chūsaishiki) and minor rites (shōsaishiki). "First, The person in charge sets out the food and drink. Next, they pour the sacred drink, and all assembled drink. Next, the naorai music is performed. Next, the person in charge removes the dishes." Also, where individual shrines have a specific practice that derives from a tradition, the naorai is performed. As we can see from this provision, there are many shrines preserving ancient practices in naorai. Naorai are performed at the end of daijōsai and niinamesai, and these are called the toyonoakari no setchi-e, where white and black sake: (shiroki and kuroki) was presented to the assembled retainers. In an Imperial Proclamation of the Emperor Shōtoku we can see the expressions "Today is the day of the toyonoakari-kiko (ceremonial dinner) of the naorai of the Ōnie" and "Today is the day of the toyonoakari-kiko of the naorai of the niinae." In the Engishiki it is mentioned that there was a naorai-den at Kasuga Shrine (now Kasuga Taisha) and also there was a building called the naorai-in at the Grand Shrines of Ise. 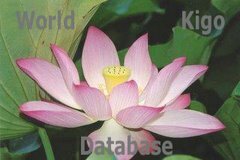 In any case it is said that the naorai has been conducted as a very important part of ceremonies and rites since ancient times. The word naorai is usually thought to derive from nahoriahi. The first character of the word connotes the end of a period of purifying body and mind for ritual (saikai), of returning to everyday life. In contrast, another theory by Orikuchi Shinobu posits a connection to the naobi no kami. Accordingly the meaning of naorai would be worship of these gods of purification at the conclusion of a ceremony, having moved to a different place, as an apology for any offences committed during the ceremony. Another interpretation identifies the first character with the idea of sitting down before a table set for a meal, and the second character with the idea of 'all meeting together.' Needless to say, this is a religious event but if it means "after the conclusion of the ceremonies, the sake (miki) and food offerings (shinsen) presented to the kami are taken down and people partake of them" then it does not have any element or meaning of ending purification. a sweet potato shochu 芋焼酎 shnaps called Naorai.
. Food and Rituals . 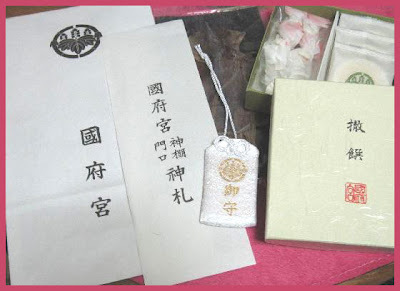 After a purification ritual, people buy a set of talismans for the new year. It inlcudes some sweets too. There are other shrines called "Okuni Shrine" in Japan. Okuni Shrine located in Mori-machi, Shuchi-gun, Shizuoka Pref. is a shrine with plentiful mythology and natural beauty. The enshrined deity is Omunachi (Okuninushi) no Mikoto. The original shrine was located in Mt. Motomiya, but it was transferred to the present place in 555, when a holy spirit appeared in the mountain. Honden (the main hall) and Haiden (oratory) are of Taisha-zukuri style. The grove of trees in the precinct is called “the Ancient Forest,” where old cedar trees of several hundred years old create superb atmosphere. The shrine is worshipped by the people all over ex-Enshu province (present-day western part of Shizuoka Pref.) and as many as 300,000 people come to offer prayers on the New Year’s Day. Visitors can enjoy natural beauty from season to season such as cherry blossoms, iris in the iris garden beside the entrance of the shrine, and autumn foliage. 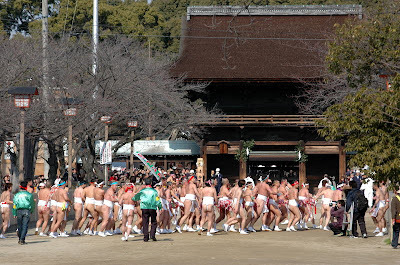 Junidan Bugaku (twelve dances), which is dedicated in the annual festival in April, and the dance in Taasobi Matsuri (festival for good harvest) in January are designated as the prefectural Important Intangible Cultural Properties.
. Naked Festivals (hadaka matsuri　裸祭り) .